A stunning and hypnotic novel by "a writer of extraordinary gifts" [Tobias Wolff], The Seal Wife tells the story of a young scientist and his consuming love for a woman known as Aleut. In 1915, Bigelow is sent to establish a weather observatory in Anchorage, Alaska, and finds that nothing has prepared him for the loneliness of a railroad town of over two thousand men and only a handful of women, of winter nights twenty hours long. And nothing can protect him from obsession-both with a woman, who seems in her silence and mystery to possess the power to destroy his life forever, and with the weather kite he designs to fly higher than any kite has ever flown before, a kite with which Bigelow plans to penetrate and know not just the sky but the heavens. 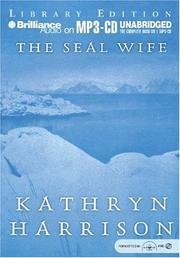 A novel of passions both dangerous and generative, The Seal Wife explores the nature of desire and its ability to propel an individual beyond himself and outside conventions. Harrison brilliantly re-creates the Alaskan frontier during the period of the first World War and in lyrical prose explores the interior landscape of the psyche and human emotions - a landscape eerily continuous with the splendor and terror of the frozen frontier, the storms that blow over the earth and its face.